Crêpes Ham & Cheese | Pasta & Co. Thick or thin, sweet or salty, soft or crunchy, crêpes are one of the best things French ever created. Following this recipe, you will get about 15 of these French style pancakes. Three crêpes each for 2 people fit a 9x7in roasting pan or pyrex. And you may use the others as dessert (Nutella or Dulce de Leche are the best fillings!). You can even prepare another pan, coat it with béchamel (but no grated cheese on top) and freeze it. If empty, crêpes can stay in the fridge for a couple of days, tops. Start preparing the crêpes as shown here. 1) Warm up the milk. 2) Melt butter in a saucepan over low heat. Once melted, stir in the flour until smooth. Continue stirring as the flour cooks to a light, golden color. 3) Add the warm milk and increase heat to medium and slowly whisk in the milk until thickened. Bring to a gentle simmer, and then reduce heat to low and continue simmering until the flour has softened for 10 to 15 minutes. 3) Remove from heat and stir in salt, grounded nutmeg and Parmigiano. Put it aside. 1) Warm the oven to 395 degrees. Grease a rectangular pyrex or a little roasting pan with butter or a little olive oil. Slice little strips about ¼ of an inch thick for the length of the cheese. 2) Place the first crêpe on a cutting board, place a slice of ham and 3/4 strips of cheese. Roll it, following the direction of the ham and place it in the pan. A 9×7in pan can fit 4-5 crêpes. 3) Coat with warm béchamel on top, make it even with a spatula and sprinkle with a generous handful of grated Parmigiano Reggiano or Grana Padano. Put in the oven for 20 minutes till the béchamel gets a golden color. Serve hot! In order for each crêpe to taste perfect and melt in your mouth, the ham must be paper thin. 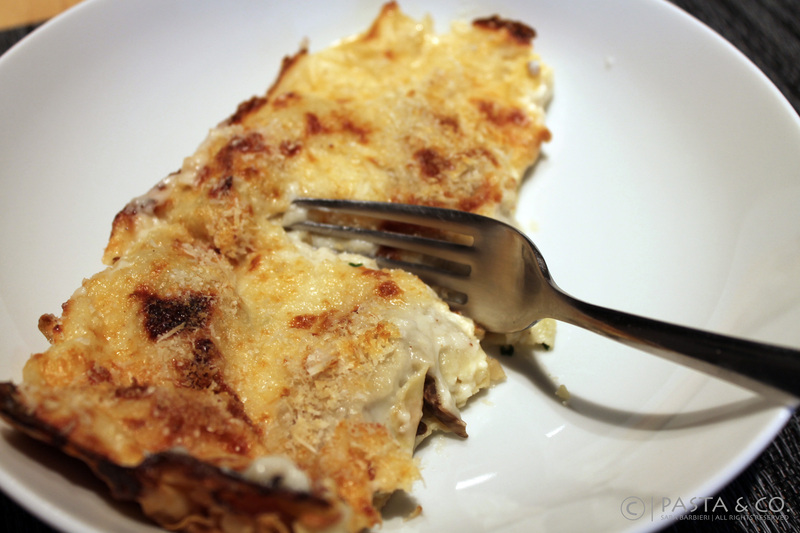 Also, bèchamel gratin, even if delicious, is not really easy on the eyes (and on the plate). An alternative would be warming the crêpes in the oven and serving them on a thin bed of bechamel.